In an interview, Biden says economy is in "much worse shape than we thought"
(CNN) -- Before he accepted Barack Obama's offer to join his presidential ticket, Joe Biden got a promise from Obama: that he would be there for "every critical decision," Biden said in an interview broadcast Sunday. Speaking to ABC's "This Week," Biden said he believes the vice president's role is to provide "the best, sagest, most accurate, most insightful advice and recommendations he or she can make to a president to help them make some of the very, very important decisions that have to be made." When Obama talked to him about the vice-presidential slot, Biden recalled, "I said, 'I don't want to be picked unless you're picking me for my judgment. I don't want to be the guy that goes out and has a specific assignment. ... I want a commitment from you that in every important decision you'll make, every critical decision, economic and political, as well as foreign policy, I'll get to be in the room.'" Biden said President-elect Obama has kept the promise, having Biden in the room for all of his decisions about who will fill key posts in the administration. Biden will have a specific assignment as the new administration gets under way, however. Come Inauguration Day, he will be the working families czar, so to speak. On Sunday, Obama's transition team announced the new "White House Task Force on Working Families" -- a major initiative targeted at "raising the living standards of middle-class, working families in America." The initiative will be chaired by Biden. In an interview with ABC's "This Week," Biden said it's a "discrete job that's going to last only for a certain period of time." "The one thing that we use as a yardstick of economic success of our administration: Is the middle class growing? Is the middle class getting better? Is the middle class no longer being left behind? And we'll look at everything from college affordability to after-school programs, the things that affect people's daily lives. I will be the guy honchoing that policy," he said. Biden said he will have the authority to get a consensus among the task force -- but will use his relationship with the president if a consensus isn't reached. "If in fact there is no consensus, [I'd] go to the president of the United States and say, 'Mr. President, I think we should be doing this, cabinet member so-and-so thinks that. You're going to have to resolve what it is we think we should do.' 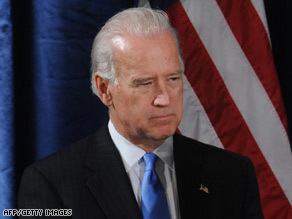 "
Joe Biden says he'll change the role of VP...but how? He joins Larry for the hour. Obama has set up several key goals for the task force, including expanding education and training; improving work and family balance; a focus on labor standards, including workplace safety; and protecting working-family incomes and retirement security. So what power will the new task force have in shaping policy? According to the transition team, Biden and other members "will expedite administrative reforms, propose Executive orders, and develop legislative and public policy proposals that can be of special importance to working families." "My administration will be absolutely committed to the future of America's middle-class and working families. They will be front and center every day in our work in the White House," said Obama in a statement. "And this Task Force will be one vehicle we will use to ensure that we never forget that commitment." And in line with the Obama team's pledge of full transparency, the task force will issue annual reports, available online to the public. Anna Burger, chairwoman of Change To Win -- a group made up of seven unions -- hailed the announcement. "[It] shows that President-elect Obama is committed to middle class families and change truly is coming to Washington. Working people finally have an administration that is willing and eager to take action to address their needs," she said in a statement. "The White House Task Force on Working Families is a vital first step toward restoring our economy and making government work for working people again." In what ABC billed as Biden's first interview as vice president-elect, Biden also discussed the role he played in helping Sen. Hillary Clinton decide to accept Obama's offer to serve as his secretary of state. "She's one of my close friends. And when this came forward, I did talk to her. She sought me out. I sought her out as well, to assure her that this was real," he said, adding that "there was a lot swirling around" at the time. Biden said he does not know whether he played a "key" role in helping Clinton make her decision. "It wasn't so much convincing, but I -- they wanted to know my perspective, and I gave my perspective." Biden also said that the nation's economy "is in much worse shape than we thought it was in," and the immediate goal is to pass another stimulus package to prevent it from "absolutely tanking." "There is going to be real significant investment," Biden said. "Whether it's $600 billion or more, or $700 billion, the clear notion is, it's a number no one thought about a year ago. "... The single most important thing we have to do as a new administration -- to be able to have impact on all of the other things we want to do, from foreign policy to domestic policy -- is we've got to begin to stem this bleeding here and begin to stop the loss of jobs in the creation of jobs," said Biden, who also said he had spoken with members of Congress from both parties about a new stimulus. The officials said Obama is increasing his goal from 2.5 million to 3 million jobs over the next two years after receiving projections early this week that suggest the recession will be deeper than expected. CNN Chief White House Correspondent Ed Henry contributed to this report.